ANNAPOLIS, Md. — A statue of the U.S. Supreme Court justice who wrote the 1857 Dred Scott decision that upheld slavery and denied citizenship to African Americans was removed from the grounds of the Maryland State House early Friday morning. 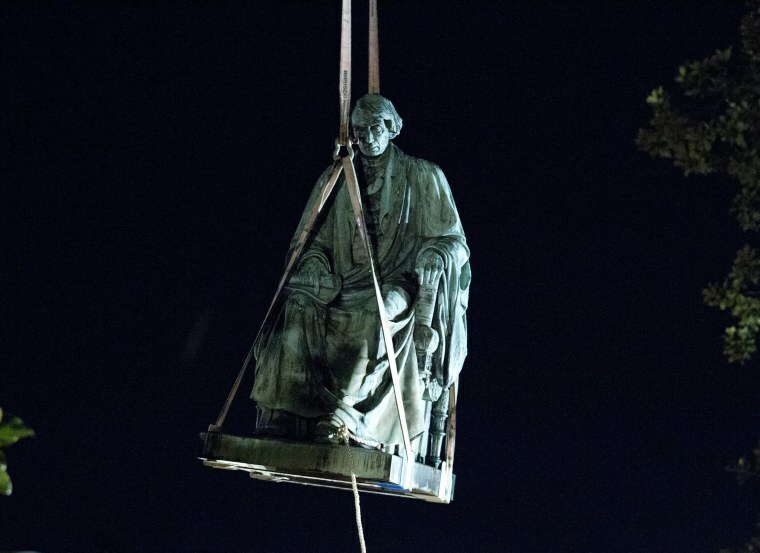 The statue of Roger B. Taney was lifted away by a crane at about 2 a.m. It was lowered into a truck and driven away to storage. The bronze statue was erected in 1872, just outside the original front door of the State House. House Speaker Michael Busch, a Democrat who was one of the three who voted to remove it, wrote this week that the statue "doesn't belong" on the grounds. His comments came after the violent protests in Charlottesville, Virginia, last weekend, when clashes broke out between white nationalists and counter-protesters. A woman was killed when a car plowed into a crowd of people who were there to condemn the white nationalists, who held a rally prompted by Charlottesville officials' decision to remove a monument to Robert E. Lee. Gov. Larry Hogan, a Republican, said this week that removing the statue of Taney in Maryland was "the right thing to do." Lt. Gov. Boyd Rutherford voted on behalf of the administration to remove the statue. One member of the trust, Senate President Thomas V. Mike Miller, criticized holding the vote without a public meeting. "This was certainly a matter of such consequence that the transparency of a public meeting and public conversation should have occurred," Miller, a Democrat, wrote in a letter Thursday to Hogan. While the statue's removal was not publicized, a couple dozen onlookers watched as workers started the removal process shortly after midnight. Some who watched cheered as the statue was lifted from its pedestal. The statue was removed a couple of days after Baltimore Mayor Catherine Pugh ordered the removal of four Confederate monuments from the city under the cover of night. A statue of Taney in Baltimore also was removed. Taney was born in Maryland and practiced law in Frederick, Maryland, before becoming the nation's fifth chief justice. Dred Scott and his wife Harriet were slaves who sued for their freedom after they were taken from the slave state of Missouri into territory where slavery had been prohibited by the Missouri Compromise. This year marked the 160th anniversary of the 1857 decision. In March, a family member of Taney's apologized to the family of Scott's in front of the statue that was removed Friday. Charles Taney IV of Greenwich, Connecticut apologized on behalf of his family to the Scott family and to all African Americans for the "terrible injustice of the Dred Scott decision." Lynne Jackson, the great-great-granddaughter of Dred Scott, accepted the apology for her family and "all African Americans who have the love of God in their heart so that healing can begin."